The Gold Street Park: Druid Heights-Baltimore Plan integrates a vision for revitalizing a vacant lot in Baltimore’s Druid Heights Neighborhood. The planning process kicked-off with community outreach and stakeholder design meetings in the fall of 2015. The final design builds upon an existing mural and includes attractive landscaping, natural play area for kids, stage for community events, and a meditation area. It also proposes sustainably sourced and environmentally advantageous building materials, with flora benefiting the neighborhood and enhancing local water quality. The site plan (shown on right) provides a social gathering spot and a park that would raise the median home values of nearby residences. And all of this would come in at under $500,000 to implement. While this sounds like another well formulated plan from Baltimore City Staff, it was completed by a team of students at the University of Maryland Department of Plant Science and Landscape Architecture. 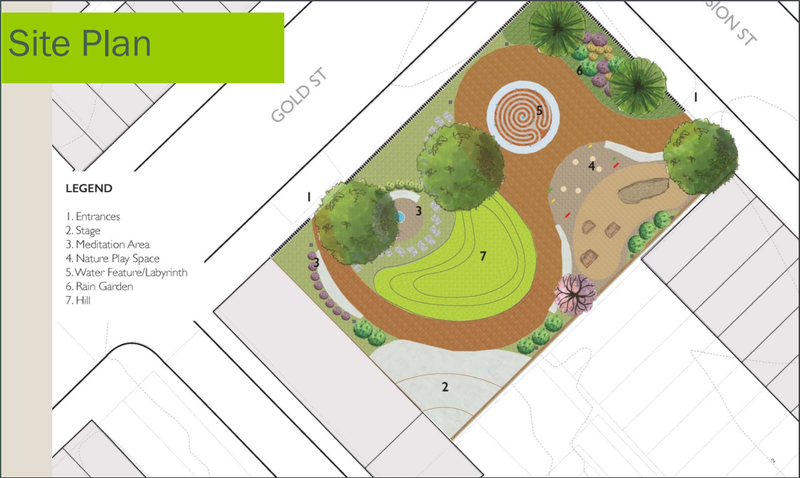 This Gold Street Park Plan won the 2016 Sustainable Growth Challenge (the Challenge), alongside the Passport 2 Harford Plan, completed by Harford Community College students. But the plan didn’t just win an award and then sit on a shelf. The Druid Heights Community Development Corporation incorporated it into a larger effort to stabilize the neighborhood, which includes the demolition of vacant structures and the construction of new homes. Planning staff recently toured the site as part of the review of a Maryland Department of Housing and Community Development grant funding request, known as the Baltimore Regional Neighborhoods Initiative (BRNI). The Challenge is a project through which the Maryland Sustainable Growth Commission (the Commission) engages Maryland college students in developing creative solutions to sustainable growth while also providing them with a career-building, real world learning experience. The Challenge is an interdisciplinary exercise promoting economic growth, environmental stewardship, and sustainable land use at the community level. Established by the Maryland General Assembly in 2010, the Commission makes recommendations on growth and development issues and celebrates smart growth achievements with an annual awards program. Exact dates for the submission, scoring, and awards ceremony are still being finalized, but the projected timeline is highlighted below. Students interested in submitting a project should consider creative, interdisciplinary approaches to sustainable growth in Maryland. The Challenge is flexible and wide ranging, just as our thinking should be when innovating for the future. In fact, narrowly defined, traditional submissions are less likely to fare well during scoring. The Commission wants to be wowed! Winners will receive recognition at the awards ceremony and in statewide publications. They will also be invited to present projects at statewide events such as the Maryland Planning Commissioners Association Conference. In addition, the Commission will invite the Dean and University Presidents of the winning schools to attend the awards ceremony. Just as with the Critical Area Circuit Rider Internship, Planning aims to establish a legacy of best practices and community and planning leadership in Maryland. The best tools for achieving this are education, mentorship, and collaboration. We look forward to next year’s submissions inspiring us. To learn more about the Sustainable Growth Challenge, contact Joe Griffiths at joseph.griffiths@maryland.gov or 410-767-4553.